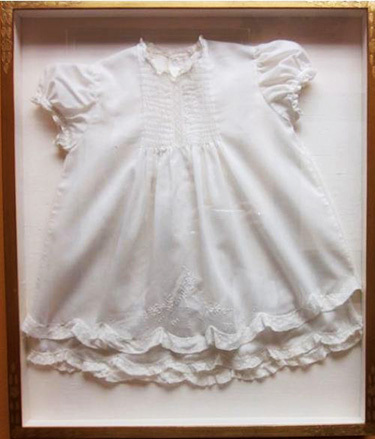 Traditional picture framing encompasses a wide variety of possibilities. In this case, we are referring to anything except for three dimensional pieces. 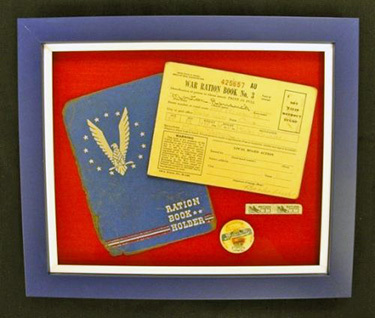 ie: photos, posters, prints, newspaper clippings, oil paintings, watercolor paintings, documents, etc., etc., etc. 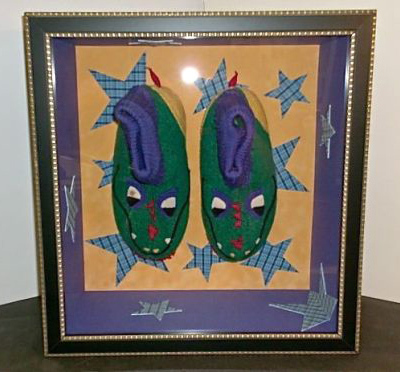 Little Boy's Slippers These slippers were framed for our client's son who is now in his 20's and works for the government. The stars were made from the pajamas he wore at the same age. 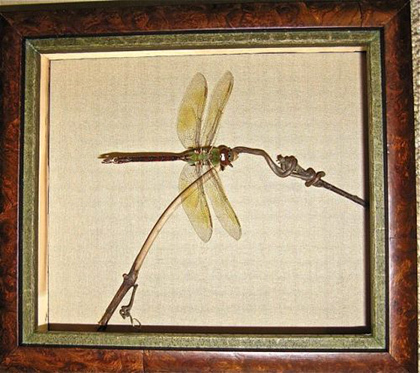 Our recently retired framer, Bunny Dadds, found this dragonfly on the parking lot behind the shop. She brought it into the shop, found him a comfortable twig for his final resting place and created a design befitting the dignity of this magnificent creature. 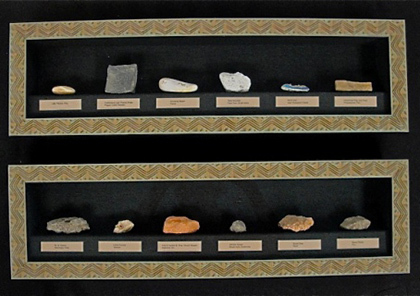 Our client collected these rocks from notable places she had traveled to all over the world. They were from Machu Pichu, the Berlin Wall, etc. We framed them so that we could identify them with custom made tags. 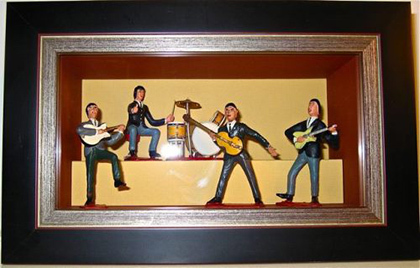 Our client had these Beatles figures from when she was a teenager during the Beatles "craze". For this job, we built a stage for Ringo and his drums. 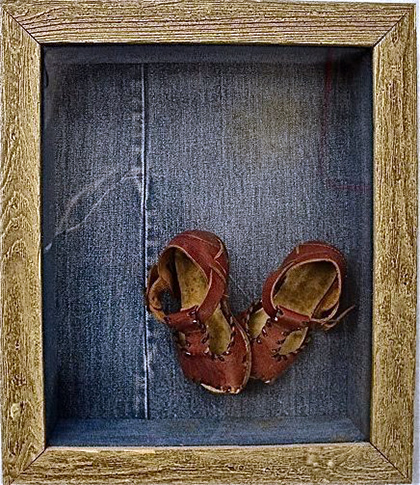 The client told the story of remembering wearing these red shoes in the park in Washington, D.C. when a goose was chasing her. 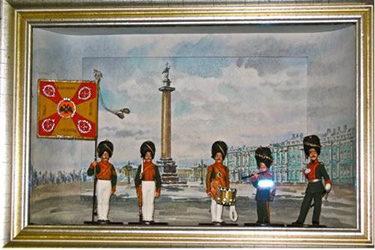 These five lead soldiers were brought to us, along with a watercolor that our client wanted to use for the background. Since the painting was too small for the purpose, Anthea cut a mat out of watercolor paper and extended the painting so that the diorama could be completed. 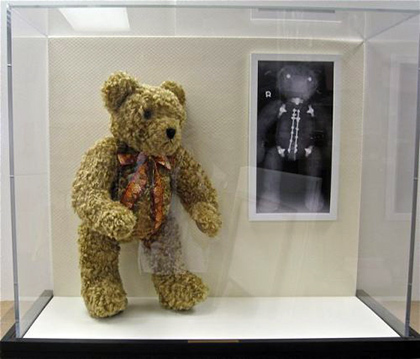 Scoli Bear was used by a doctor who traveled throughout the world lecturing on childhood scoliosis. The teddy bear was used because he is the size of a child for whom the surgery could be performed. He was housed in a plexiglas box, along with an x-ray showing his corrected spine. 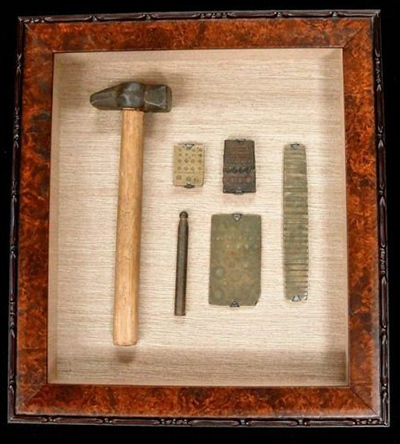 The box needed to be sturdy enough to withstand the rigors of his travels, and constructed to allow access to scoli bear for the doctor to use for his lectures and demonstrations.